It is only a decade ago that the eighteenth-centurydistinction between civil society and the state seemed old-fashioned, an object of cynicism, even of outright hostility. In this important new book, John Keane shows how, in a wholly unexpected reversal of fortunes, this antiquated distinction has since become voguish among politicians, academics, journalists, business leaders, relief agencies and citizens’ organizations. John Keane examines the various sources and phases of the dramatic world-wide popularization of the term. He traces its reappearance in a wide range of contexts – from China to Tunisia, from South Africa to the emerging European Union – and clarifies the conflicting grammars and vocabularies of the language of civil society. Considerable care is taken to highlight the different possible meanings of the distinction between civil society and the state. The book argues that the civil society perspective makes it possible to develop bold new concepts of power, property, violence, politics, and democracy, and suggests that the formation of civil society may be the best antidote to the worldwide problems of nationalism. At the same time, John Keane also explores the fissures within civil society; he asks why civil societies generate patterns of violence that contradict the freedom and solidarity on which they are based, and discusses the possible effects on civil society of the fracturing of “the public sphere” and public opinion in the face of rapid changes in information technology. Keane also takes the reader into previously uncharted intellectual territory by demonstrating that the civil society perspective contains unharnessed potentials: that it is possible to develop bold new images of civil society that alter the ways in which we think about matters such as power, property, violence, politics, publicity and democracy. Civil society is one of the great slogans of the 1990s, linked to phenomena ranging from the decline of the Western welfare state to the transformation of the former Soviet bloc to resistance against authoritarian regimes in the developing world. This book nicely charts the spread of civil society discourse to show why it has fit so many different contexts. 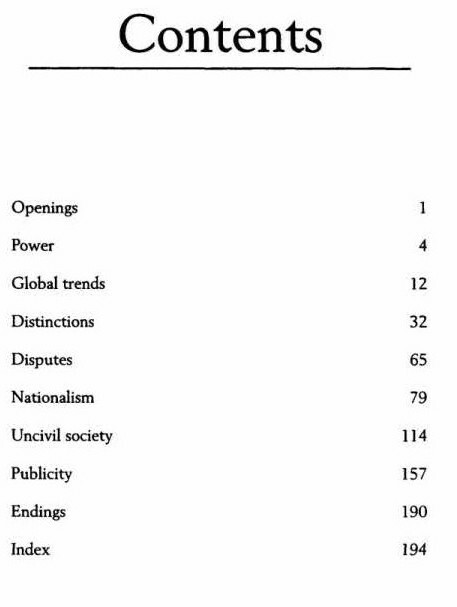 Its popularity, Keane argues, stems from the growing realization that a stable democracy rests not only on properly functioning elections and institutions but on the more elusive “civil” qualities in society. Most scholars consider the state to be civil society’s counterpart, and many activists have used the notion of civil society to resist oppressive regimes. But Keane neatly dissects this approach, noting that no simple relationship between the state and civil society exists. On the subject of national identity, he argues that although the rise of nationalism in early modern Europe helped foster the growth of civil society, today it is more likely to hinder it. The author concludes by asking how citizens can foster civil society through wider political action, but suggests that such a task still has a long road ahead. Although the book does not break new ground, it provides a thoughtful guide to the debate. “John Keane was the original civil society theorist – not in the sense that he invented the concept but that it was his books of the 1980s – Democracy and Civil Society and the edited collection Civil Society and the State – that educated most of us in the West in the rediscovered concept of civil society, at that time flourishing mainly among Central and Eastern European dissident intellectuals such as Vaclav Havel, Gyorgy Konrad and Adam Michnik. It was Keane who made us aware of this revival, and who produced the material for further reflection on a concept that, apart from in a few Gramscian strongholds, had more or less disappeared from the political vocabulary. Now he reflects on his own enterprise, and on the fate of the concept over the past decade. He remains as firmly convinced as he ever was of its worthwhileness, and notes with some satisfaction its astonishing worldwide diffusion in recent years. But that very popularity brings its own problems of confusion and misuse. As in all his writings Keane is properly alert to the limitations and dangers of the civil society idea, its too easy use as a talismanic device by political rhetoricians and theoreticians of all kinds, Keane chides Earnest Gellner for his Panglossian view of civil society, as an all-embracing all-resolving alternative to authoritarianism; he criticizes those who too readily assume that democracy or nationalism and civil society make natural bed-fellows and he acknowledges that ‘incivility’ – which includes violence and the extremes of poverty and inequality – is a ‘chronic feature’ of civil society. He aims to develop a ‘post-foundationalist’ understanding of civil society that both recognizes these problems and at the same time meets the criticism that the concept is unduly ethnocentric as well as anachronistic.